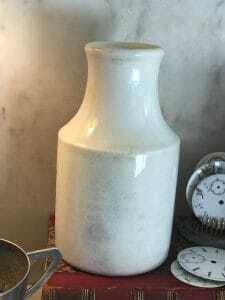 Measures approximately 2.75” wide at base, 1.75″ wide at mouth x 5.5″ tall . 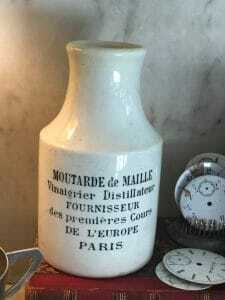 This listing is for (1) French Mustard de Maille Vinaigrier-Distillateur Fournisseur des Premieres Cours De L’Europe Paris. c. 1880’s Moutarde Maille dates back to 1747 in Dijon, France when Antoine Maille, master mustard & vinegar maker, created the artisanal brand. Maille was appointed by Louis XV as the royal supplier, and was later similarly appointed by the countries’ royalty. 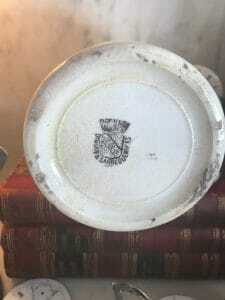 Beautiful White pot with Black lettering, very clean condition with very minor discoloration as pictured indicating its age. Displays beautifully. This would be a wonderful addition to your advertising collection as it has a great height and Black and White is always coveted in advertising pieces.